The bell is amputated from its string. lips and into this stark atmosphere. to build myself a honeycomb of golden protection. “Allison’s poetic prose is insightful, enwrapping, illuminating and brutally truthful. It probes the nature of the human spirit, relationships, spirituality and God. It is sung as the clearest song is sung within a cathedral by choir. It is whispered as faintly as a heartbroken goodbye. It is alive with the life of a thousand birds in flight within the first glint of morning sun. It is as solemn as the sad-sung ballad of a noble death. Read at your peril. You will never look at this world in quite the same way again. Your eye will instinctively search the sky for eagles and scan the dark earth for the slightest movement of smallest ant, your heart will reach for tall mountains, bathe in the most intimate of passions and in the grain and grit of our earth. Such is Allison Grayhurst. Such is her poetry. THE RIVER IS BLIND is a must-read,” Eric M. Vogt, poet and author. 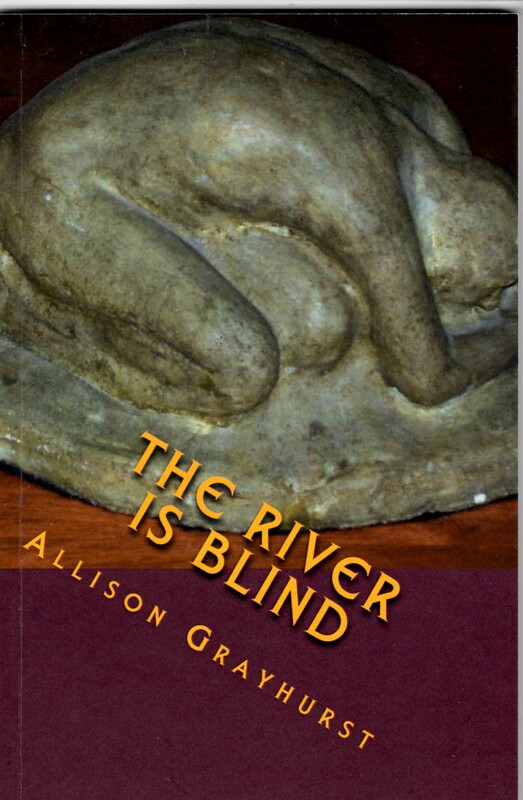 This entry was posted in Excerpts from Book 24 "The Poetry of Allison Grayhurst - completed works from 1988 to 2017 (Volume 3 of 5)", Excerpts from Book 9 "The River is Blind" Edge Unlimited Publishing (2012), Poems Published and tagged Allison Grayhurst, philosophical, poetry, spiritual. Bookmark the permalink. Speaking the complexity and simplicity that lies within! This poem is BRILLIANT. Full of words and images and moments so accurately captured, it takes my breath away to think my own moments and experiences can be so known and shared by another. “The bell is amputated from its string.